As a Customer service manager, the job task would be to ensure that the needs of the customers are satisfied to the utmost. 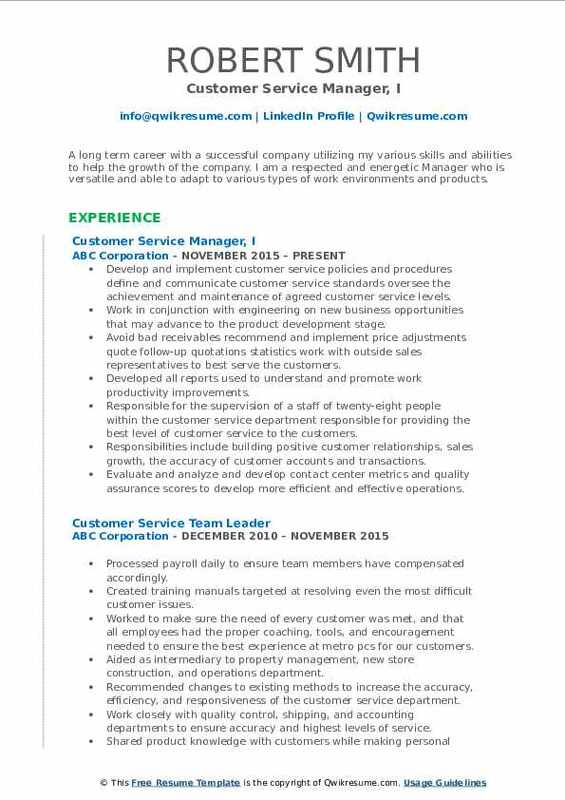 The job description of these managers is to provide an outstanding customer service, and to fulfil this aim, the following associated tasks are also supposed to be executed- developing and implementing customer service policies, finding ways to measure customer satisfaction level, managing the service team, handling direct enquires of customers and executing financial responsibilities as well. 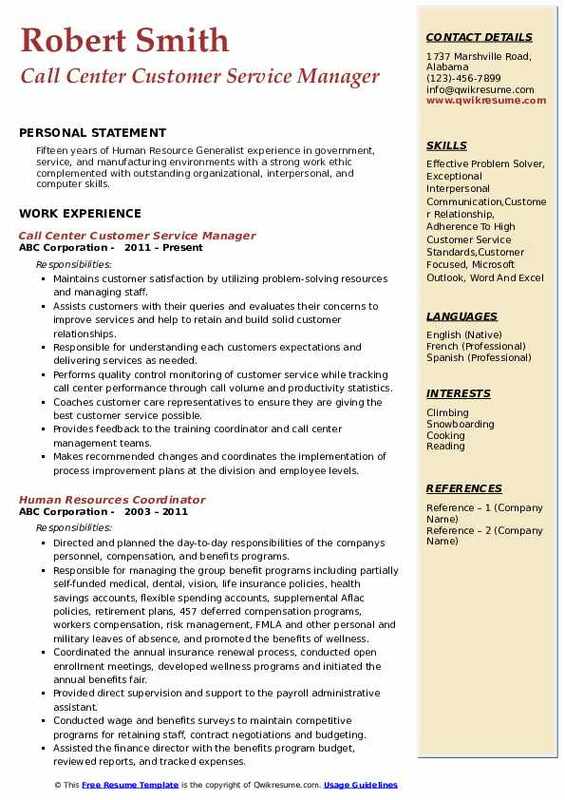 Aspiring candidates must portray in the Customer Service Manager Resume skills such as – customer service expertise, excellent knowledge of management techniques and methods, working knowledge of customer service software and database tools, advanced troubleshooting skills and customer service orientation. Customer service managersdon’t need a degree to perform this role, although a general education would prove to be useful as many large companies prefer to see this on the CV’s. 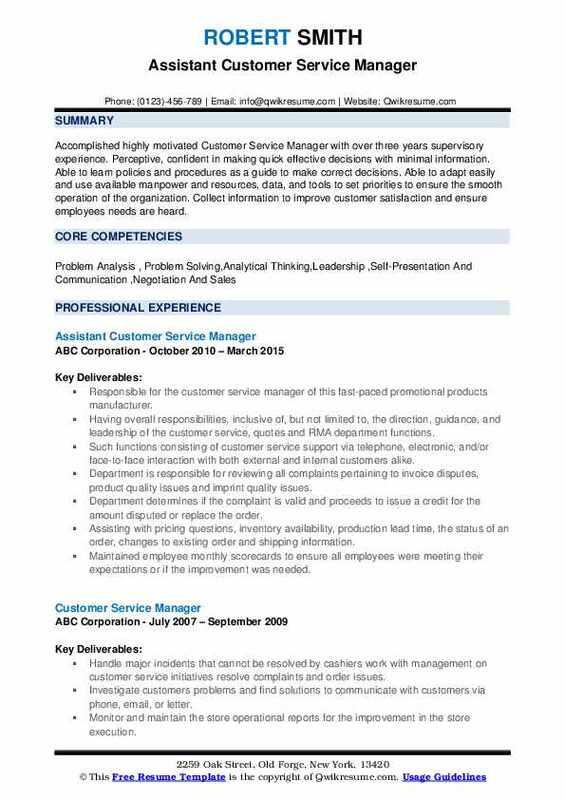 Summary : Accomplished highly motivated Customer Service Manager with over three years supervisory experience. Perceptive, confident in making quick effective decisions with minimal information. Able to learn policies and procedures as a guide to make correct decisions. Able to adapt easily and use available manpower and resources, data, and tools to set priorities to ensure the smooth operation of the organization. Collect information to improve customer satisfaction and ensure employees needs are heard. Responsible for the customer service manager of this fast-paced promotional products manufacturer. Having overall responsibilities, inclusive of, but not limited to, the direction, guidance, and leadership of the customer service, quotes and RMA department functions. Such functions consisting of customer service support via telephone, electronic, and/or face-to-face interaction with both external and internal customers alike. Department is responsible for reviewing all complaints pertaining to invoice disputes, product quality issues and imprint quality issues. Department determines if the complaint is valid and proceeds to issue a credit for the amount disputed or replace the order. Assisting with pricing questions, inventory availability, production lead time, the status of an order, changes to existing order and shipping information. Maintained employee monthly scorecards to ensure all employees were meeting their expectations or if the improvement was needed. Summary : To efficiently and professionally coordinate desired contacts with the use of persuasive and compelling communication for successful, long term business. An opportunity to practice and elevate my interpersonal skills, as well as to acquire new knowledge in order to grow as an employee and individual. 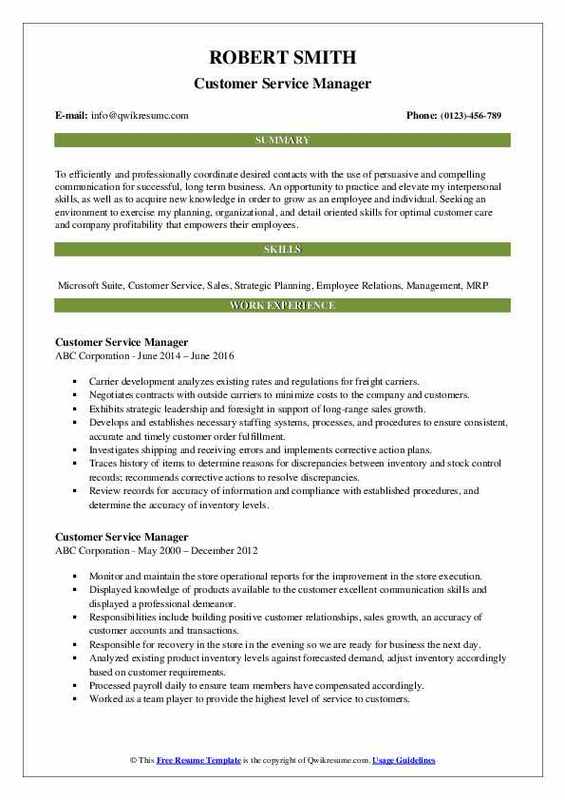 Seeking an environment to exercise my planning, organizational, and detail oriented skills for optimal customer care and company profitability that empowers their employees. Carrier development analyzes existing rates and regulations for freight carriers. Negotiates contracts with outside carriers to minimize costs to the company and customers. Exhibits strategic leadership and foresight in support of long-range sales growth. Develops and establishes necessary staffing systems, processes, and procedures to ensure consistent, accurate and timely customer order fulfillment. Investigates shipping and receiving errors and implements corrective action plans. Traces history of items to determine reasons for discrepancies between inventory and stock control records; recommends corrective actions to resolve discrepancies. Review records for accuracy of information and compliance with established procedures, and determine the accuracy of inventory levels. Counsel employees regarding job related problems, organizational policies, procedures and disciplinary actions. 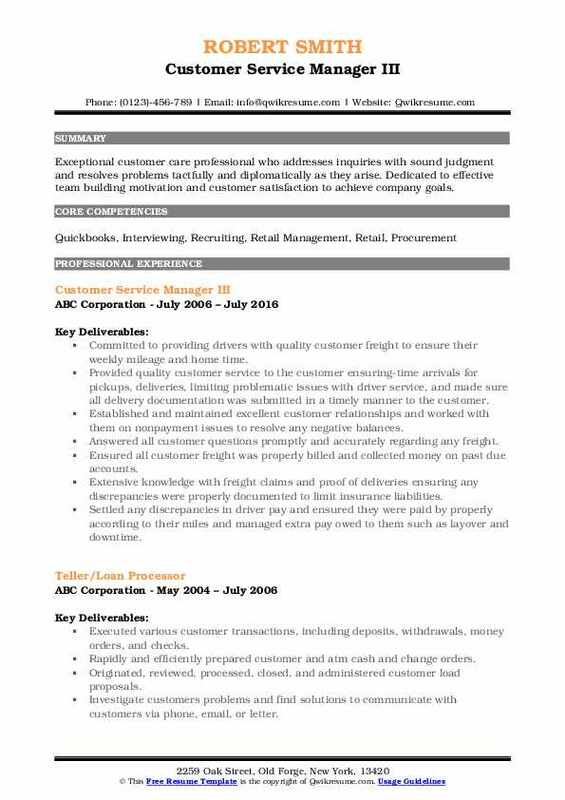 Summary : A long term career with a successful company utilizing my various skills and abilities to help the growth of the company. I am a respected and energetic Manager who is versatile and able to adapt to various types of work environments and products. Develop and implement customer service policies and procedures define and communicate customer service standards oversee the achievement and maintenance of agreed customer service levels. Work in conjunction with engineering on new business opportunities that may advance to the product development stage. Avoid bad receivables recommend and implement price adjustments quote follow-up quotations statistics work with outside sales representatives to best serve the customers. Developed all reports used to understand and promote work productivity improvements. Responsible for the supervision of a staff of twenty-eight people within the customer service department responsible for providing the best level of customer service to the customers. Responsibilities include building positive customer relationships, sales growth, the accuracy of customer accounts and transactions. Evaluate and analyze and develop contact center metrics and quality assurance scores to develop more efficient and effective operations. 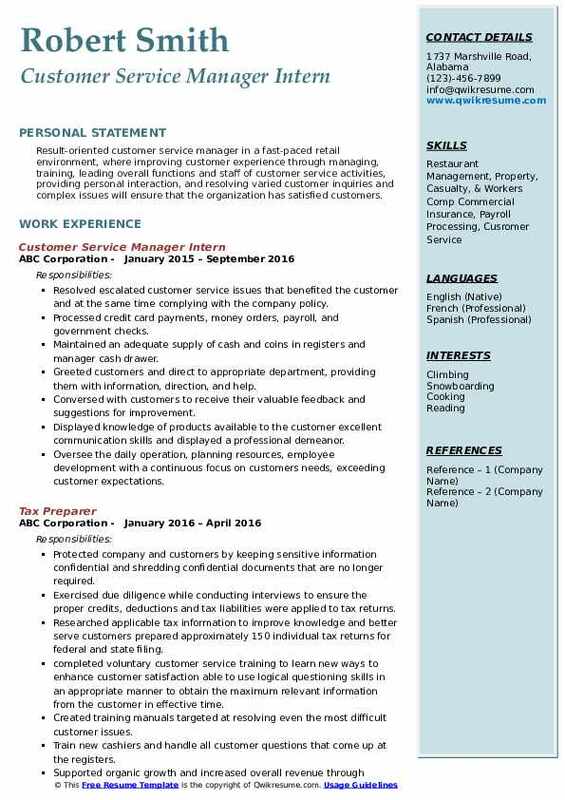 Objective : Result-oriented customer service manager in a fast-paced retail environment, where improving customer experience through managing, training, leading overall functions and staff of customer service activities, providing personal interaction, and resolving varied customer inquiries and complex issues will ensure that the organization has satisfied customers. Resolved escalated customer service issues that benefited the customer and at the same time complying with the company policy. Processed credit card payments, money orders, payroll, and government checks. Maintained an adequate supply of cash and coins in registers and manager cash drawer. Greeted customers and direct to appropriate department, providing them with information, direction, and help. Conversed with customers to receive their valuable feedback and suggestions for improvement. Displayed knowledge of products available to the customer excellent communication skills and displayed a professional demeanor. Oversee the daily operation, planning resources, employee development with a continuous focus on customers needs, exceeding customer expectations. Headline : Seasoned management professional who excels in establishing excellent working relationships with customers, employees, vendors and contractors. 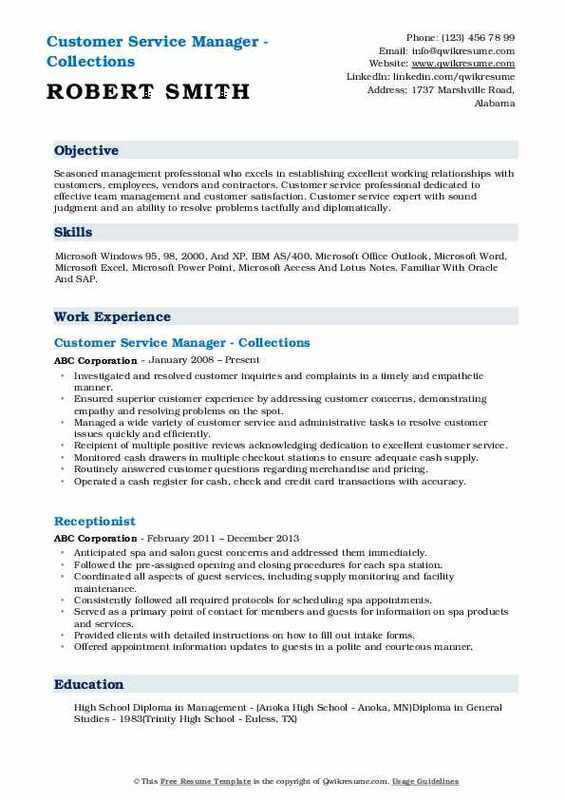 Customer service professional dedicated to effective team management and customer satisfaction. Customer service expert with sound judgment and an ability to resolve problems tactfully and diplomatically. Skills : Microsoft Windows 95, 98, 2000, And XP, IBM AS/400, Microsoft Office Outlook, Microsoft Word, Microsoft Excel, Microsoft Power Point, Microsoft Access And Lotus Notes. Familiar With Oracle And SAP. 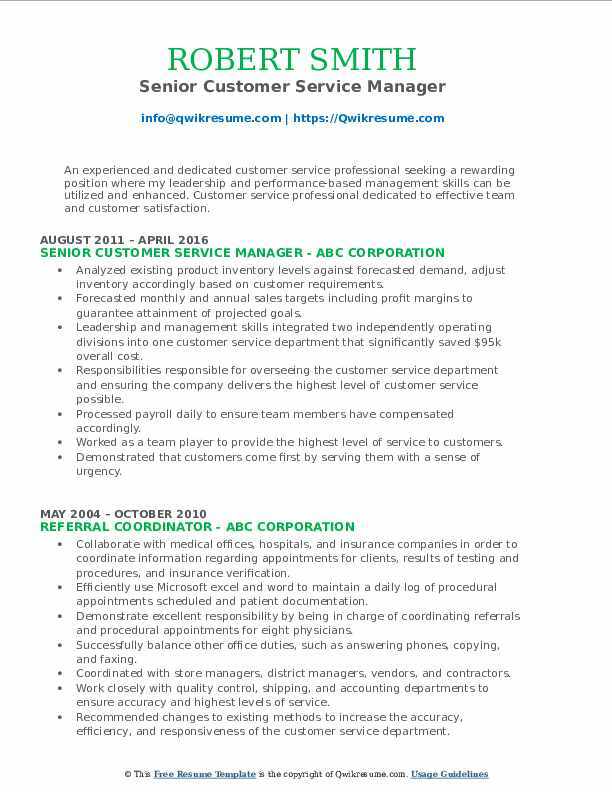 Summary : An experienced and dedicated customer service professional seeking a rewarding position where my leadership and performance-based management skills can be utilized and enhanced. Customer service professional dedicated to effective team and customer satisfaction. Analyzed existing product inventory levels against forecasted demand, adjust inventory accordingly based on customer requirements. Forecasted monthly and annual sales targets including profit margins to guarantee attainment of projected goals. Leadership and management skills: integrated two independently operating divisions into one customer service department that significantly saved $95k overall cost. Responsibilities responsible for overseeing the customer service department and ensuring the company delivers the highest level of customer service possible. Processed payroll daily to ensure team members have compensated accordingly. Worked as a team player to provide the highest level of service to customers. Management and planning of onboarding process to include assigning and directing work. Summary : Exceptional customer care professional who addresses inquiries with sound judgment and resolves problems tactfully and diplomatically as they arise. Dedicated to effective team building motivation and customer satisfaction to achieve company goals. Committed to providing drivers with quality customer freight to ensure their weekly mileage and home time. Provided quality customer service to the customer ensuring-time arrivals for pickups, deliveries, limiting problematic issues with driver service, and made sure all delivery documentation was submitted in a timely manner to the customer. Established and maintained excellent customer relationships and worked with them on nonpayment issues to resolve any negative balances. Answered all customer questions promptly and accurately regarding any freight. Ensured all customer freight was properly billed and collected money on past due accounts. Extensive knowledge with freight claims and proof of deliveries ensuring any discrepancies were properly documented to limit insurance liabilities. Settled any discrepancies in driver pay and ensured they were paid by properly according to their miles and managed extra pay owed to them such as layover and downtime. Summary : Fifteen years of Human Resource Generalist experience in government, service, and manufacturing environments with a strong work ethic complemented with outstanding organizational, interpersonal, and computer skills. Maintains customer satisfaction by utilizing problem-solving resources and managing staff. Assists customers with their queries and evaluates their concerns to improve services and help to retain and build solid customer relationships. Responsible for understanding each customer's expectations and delivering services as needed. Performs quality control monitoring of customer service while tracking call center performance through call volume and productivity statistics. Coaches customer care representatives to ensure they are giving the best customer service possible. Provides feedback to the training coordinator and call center management teams. Makes recommended changes and coordinates the implementation of process improvement plans at the division and employee levels. 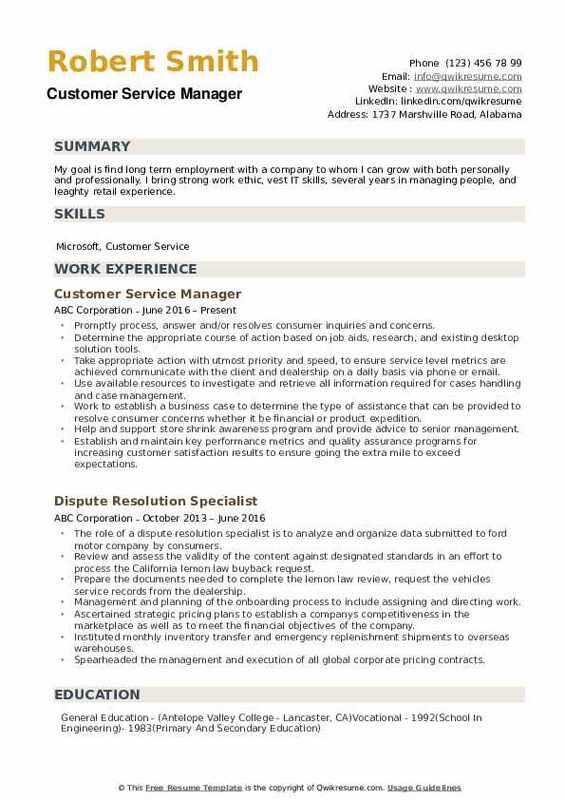 Summary : My goal is find long term employment with a company to whom I can grow with both personally and professionally. I bring strong work ethic, vest IT skills, several years in managing people, and leaghty retail experience. Promptly process, answer and/or resolves consumer inquiries and concerns. Determine the appropriate course of action based on job aids, research, and existing desktop solution tools. Take appropriate action with utmost priority and speed, to ensure service level metrics are achieved communicate with the client and dealership on a daily basis via phone or email. Use available resources to investigate and retrieve all information required for cases handling and case management. Work to establish a business case to determine the type of assistance that can be provided to resolve consumer concerns whether it be financial or product expedition. Help and support store shrink awareness program and provide advice to senior management. Establish and maintain key performance metrics and quality assurance programs for increasing customer satisfaction results to ensure going the extra mile to exceed expectations.